I am almost finished with the coffee table top. 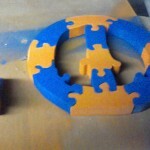 I hope to glue it up Friday, and attach the top sometime this weekend. This mosaic is more colorful than others I have made. 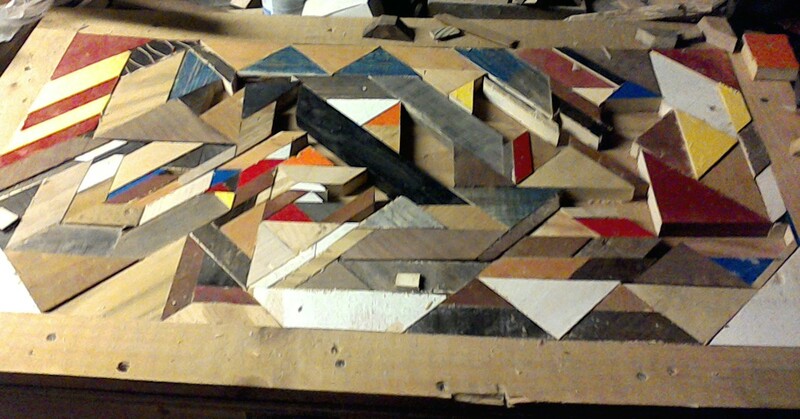 Most of my painted scrap wood is white, black, red and occasionally blue. I had some yellow and orange pieces that I have been saving for the right project, since the base I am using is yellow I thought this was the right table for the yellow and orange scraps. To attach the top I will have to reinforce and tighten the legs and add extra supports. It looks like yellow was not the original color, it may have been green. Before I add the top I may do a little sanding and expose some of the green, giving it a distressed look. I think it wood look cool. What else am I up to? I put another wall hanging on etsy. It’s made from pallet wood, cutting board cull and barn board. 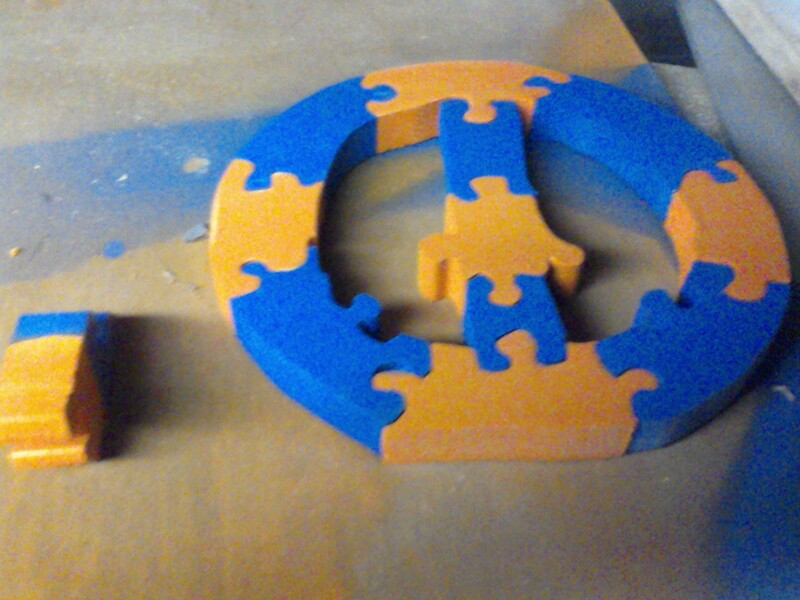 I painted another peace sign, the new one is orange and blue. I hope to put that up once the paint dries. 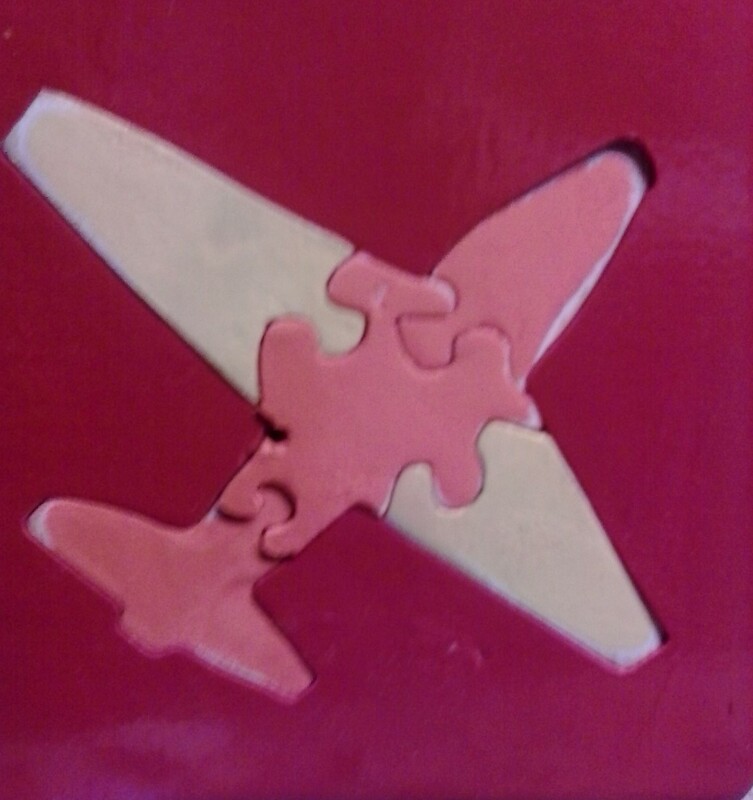 I finished painting the airplane puzzle and frame. This one is a prototype, I painted the frame with enamel paint which would be unsafe for kids. If I decide to sell it I would sell it as a decorative item only. Most likely I will keep it to use as a template for other plane puzzles. When I make new puzzles I will leave them natural and apply a food safe oil or paint using non toxic kid friendly paint. This entry was posted in barn board, for sale, old projects, puzzles, repurposeing, scrap wood, tables, wall art, wood working by brighid. Bookmark the permalink.